Cache Creek is located at the Junction of Hwy 97 (north to the Cariboo) and the Trans Canada Hwy 1 East to Kamloops and Thompson Nicola. 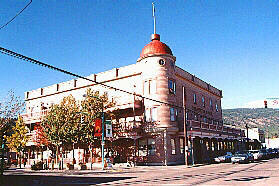 Cache Creek is a popular stopping point for those traveling between Hope and the Cariboo. The community of Ashcroft is nestled in a lush spot in the river valley, while the area surrounding Ashcroft is a unique landscape of desert-like rolling hills vegetated with dry tumbleweeds and sage. The community is located 4km (2.5 miles) northeast of Hwy 1. The Ashcroft Museum building was originally the 1917 post office. Fascinating displays include those of the areas mining, ranching and railway industries and Native Indian and Chinese histories.The museum is located at 4th and Brink Streets. This beautifully restored Manor House is now a Tea House and gift shop. Ashcroft Manor is located on the TransCanada Hwy, just south of the Ashcroft exit. From Ashcroft, take Hwy.97C which leads to Logan Lake, Merritt and the Nicola Valley. 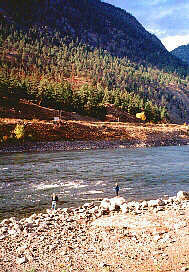 When the steelhead are running, you will see numerous people fishing the Thompson River. In the spring and fall, you will often see big horn sheep grazing within the town limits. As well as being the transportation hub of the Thompson Nicola, this is still cowboy country. North America's largest working cattle ranch, the Douglas Lake Ranch, is found here and offers guided tours to visitors. During the summer the annual outdoor Mountainfest: Merritt Mountain Music Festival attracts visitors to this Country Music Festival. Merritt is located at the junction of the Coquihalla Hwy 5, Hwy 5A (the old hwy between Merritt and Kamloops) and the Okanagan Connector (Hwy 97C) to Peachland. Anglers are excited by a sign in Merritt that promises "a lake a day, as long as you stay". When in town, be sure to see the Coldwater Hotel. Built just after the turn of the century, it is still in use today. The museum focuses on life in the region at the turn of the century. Several buildings have been restored. It is located at 2202 Jackson Avenue.